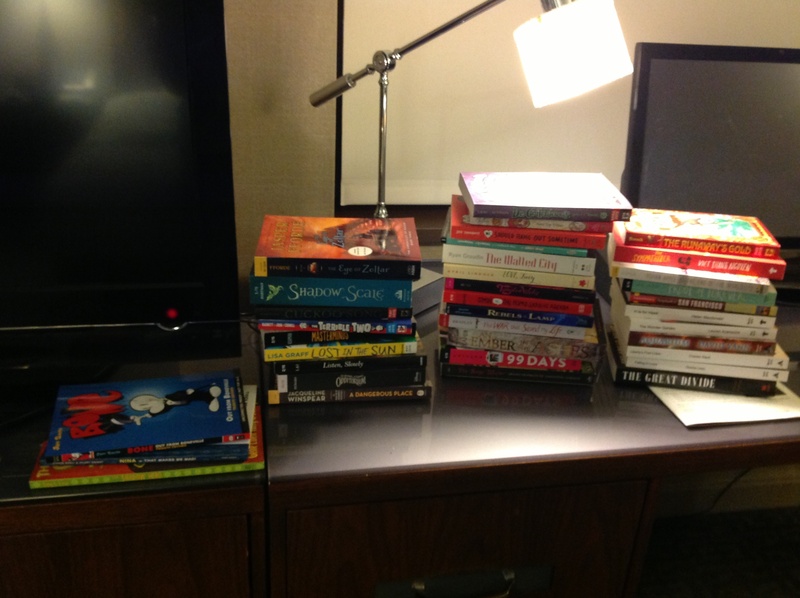 I try to restrain myself at ALA! Really I do! But it’s been more than a year since I went to an ALA conference. My self-control is ebbing. 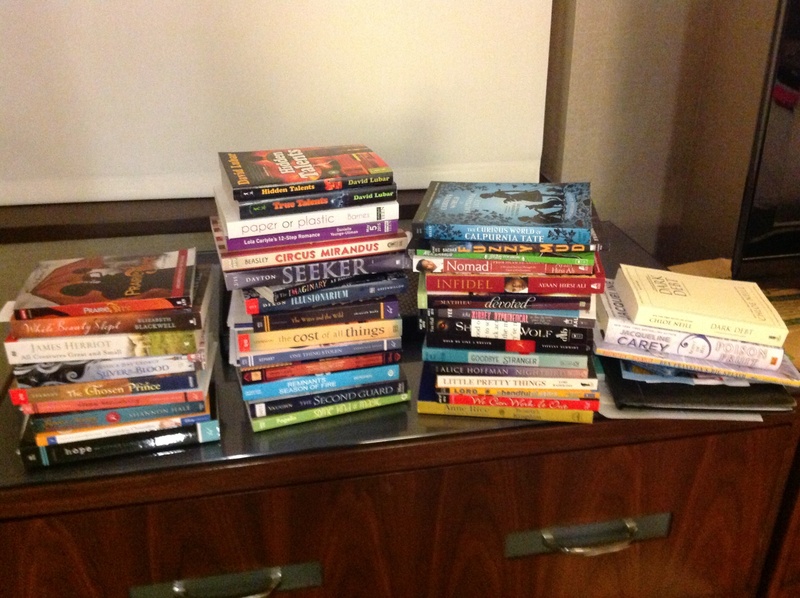 The second day, with a trip back to the hotel in the middle to drop off books — I got 42.2 books. I’m calling a Naomi Novik booklet with the beginning of her new book a tenth of a book, and same for a CD sampler from Guys Listen! with excerpts from various audiobooks. Today I got While Beauty Slept, signed by Elizabeth Blackwell, a book I’ve been meaning to read for some time. And the only books I paid for ($6 each): Infidel and Nomad, signed by Ayaan Hirsi Ali. She worked in a ThinkTank. Managing immigration in Holland. How much immigration can a welfare state absorb and remain a welfare state? On 9/11, when she saw the towers fall, she prayed that it was not Muslims who did this. Was frightened when some Muslim kids were filmed being happy about it. Holland was trying to pretend that nothing had happened. A vast march of Muslims saw the attacks as the right way to attack the infidels. She had to evaluate where she stood on Islam. Donna Seaman: Talk about when you discovered your first school library. Hirsi Ali: The institution called a library is why she’s here. The most highly read copies had the end missing, but they were still kept in the library. That was the seeding of her intellectual life. What was your education like before that? We are not Islands. Our communities exercise control. When she was in Somalia, it was all about the collective — everyone policing her behavior, and everyone else’s behavior. She moved to Kenya at 10 years old, and she went to school, because her father insisted. In hindsight, a little bit of my ethical moral training came from Nancy Drew and Hardy Boys. Also the individualistic way of thinking about things — the basis was laid back then. For an average student, seeded with extremely limited resources with the ideas of the enlightenment…. shows how important children’s minds are. If we consciously try to promote the ideas of the enlightenment, we can reach children’s minds. For her, her writing is more about the message than about the craft. English is her 4th language. You need the freedom of expression for her message to get out. She was amazed when she moved to the Netherlands at the freedom of expression. When the Dutch had a flood, they blamed the government, rather than God! In the context where she grew up, her questions were clamped down. After she wrote Infidel, she became famous or infamous, just from telling the story — and she offended the community she grew up in. The collective was not ready to reveal these things to the world. 99% of western society said it was different — but not some of the fundamentalist westerners. Authoritative collectives treat individuals the same way. This is something universal. She learned from the responses is that there are degrees in which the authoritative collective can inhibit freedom. Where we are now is going to military means first. Most Muslims are good people. They are not going to become atheists. In 2010, she thought they should become Christians. Then Arab Spring happened. She saw crowds of young people demanding freedom. After they were standing up to despots, they will learn to stand up to the personal despot. Students will start asking questions. Now seeds for reformation are there. She is seeing young women having a state of dissonance. Some choose to clear that dissonance by becoming more fundamentalist. They cocoon themselves by going by the letter. What gives her hope is those who try to get to the core of the text. We need a new relationship with God. Librarians are probably the happiest community on the planet because they have time to read. It helps to remember when Christianity was as intolerant as Islam is now. And remember that those who wanted change were accused of blasphemy. Remember that with Christianity: That’s how it was. 500 years ago, Christians were easily offended as well. Librarians can encourage those conversations. Libraries are a place where you come and reflect. Think of libraries as temples of enlightenment. People who are vulnerable to terrible ideas need to see competition of ideas at libraries. We need the courage to say, if I’m in a place to choose between my conscience and the demands of a God, I need to choose my conscience. 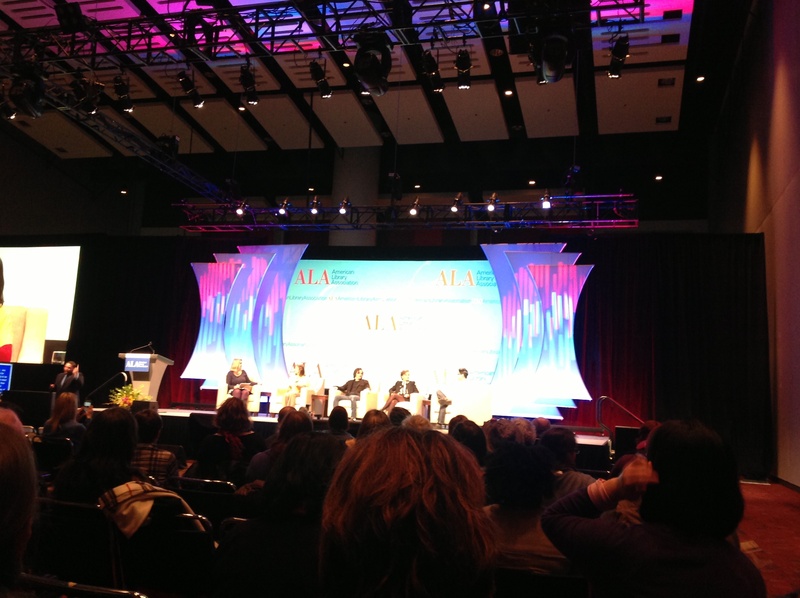 Today at ALA Midwinter Meeting in Chicago, I went to a panel called Women in Geekdom. 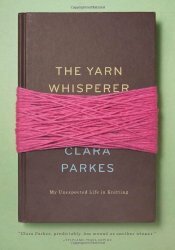 It was excellent, about reaching out to women via libraries. Tricia Bobeda — Nerdette Podcast – Nerd is not what you love but how much you love it. 50,000 people listen. All you need to podcast is a computer and a decent microphone. The world is changing, and students need access and exposure to learn. Research: Why women choose computer science: Encouragement and exposure. That’s something librarians do. Similarities between libraries and museums. Have won the Eisner’s for best retailer. She reviews comics. Samantha Nelson, Moderator: “Gamers love to talk to other Gamers.” Libraries can be a space for that. Tricia: Kickstarter is a similar model to Public Radio. Membership can also be about getting together and sharing ideas. Mo Fong – There is lots of collaboration in Computer Science, and that works well with libraries. Emily : Libraries and Museums have the advantage of an exciting physical space. The majority of their community building happens online. You can invite people to come into the physical space. Molly Jane: People assume comic fans are antisocial — but they connect with fellow enthusiasts. Libraries can foster that sort of community. Moderator: Geekdom can seem intimidating. A library can help people get that first exposure. Mo: Finding out what students already love within their communities and adding those: Arduino lights on shoes! Host a Made with Code Party — comes in a box. You’re a facilitator. Minimal cost and equipment. Only 18% of Computer Science Graduates today are women. CS First Clubs. Targeted toward middle schoolers. Tied to themes — music art, fashion, games, friends. Clubs we can run. Tricia: Podcasting is a safe space, like libraries. Not afraid to show themselves as beginners. If kids can become the teachers, it’s less scary, and it’s empowering. Get the kids in your community face to face with scientists. Emily – She has a web series where she continues to ask the amateur questions. Learning together is a unifying thing. NOT the empty vessel model. Allowing kids to become an authority is so empowering for them. Molly Jane: Intimidating when starting out in comics. Libraries are great places to get around that. You just need a kind understanding person to help you figure out what you need to know. Making you feel like you can dive in. Samantha: A program is only successful if people show up. How do you combat the perceptions as a waste of time? More brain power used than the game of chess. How do we make it clear and remove the negative stigmas? How do we explain the social and mental benefits? Emily: Can go both ways. She hated everything as a teenager — you also need to appeal to the kid. Associated with the library gives it built-in credibility! Depends on the age of the kids, too. Mo: Curious about how we get interest at different ages. Can there be parallel programming for the parents? Tricia: Journalists and librarians are conduits for actual understanding. Street cred to what we do! Make partnerships so kids can see actual scientists. Molly Jane: Get comic artists to do signings. Why do you think women are less represented in your groups? It’s empowering to meet other women interested. Library can be a place where that happens. When they started Nerdette it was to give women a space. Mo: Perception is a problem. What books do you highlight? In history, women were not seen as any less capable with computer science. We call the shots on what’s cool. We don’t have enough positive female role models in these fields. Take a stance on issues! Highlight women scientists! You can expand people’s ideas of what games can do. Parents do bristle at things marketed for boys or for girls. Public librarians: Reach out to the community colleges. Steer young people to the special programs. First Robotics programs (free, online). Tricia: Don’t be apologetic to ask the community for help! Mo: You only need one person super passionate about things to make things work. 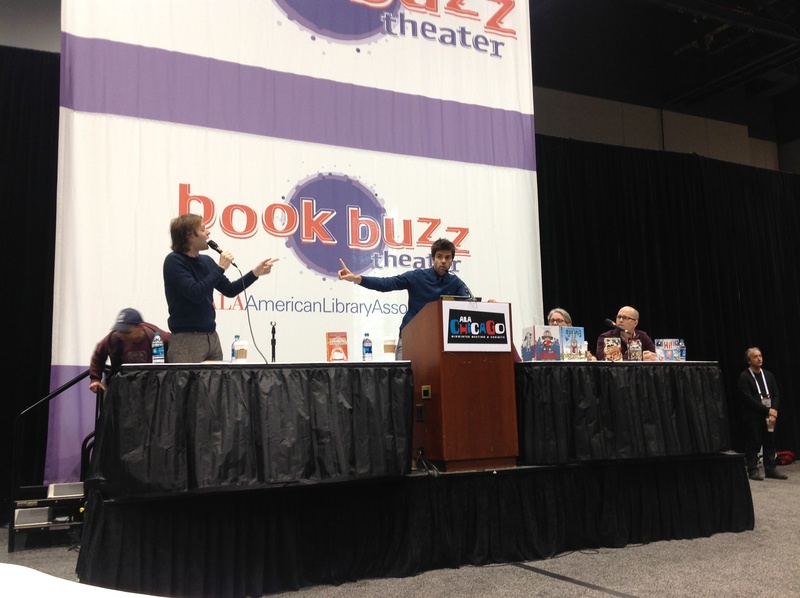 This morning, at ALA Midwinter Meeting, I started off my morning in the Book Buzz Theater for the Abrams Preview of upcoming titles. 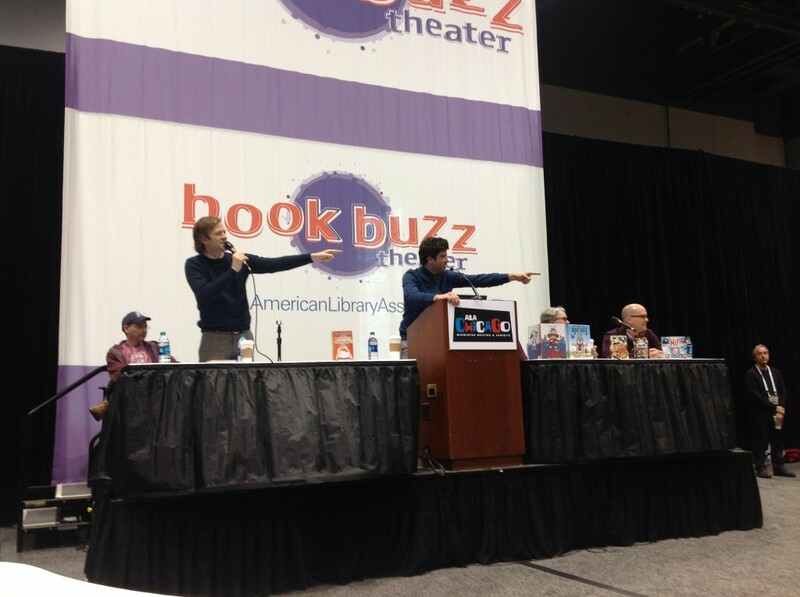 Mac Barnett & Jory John started it off, talking about their new book, The Terrible Two – It’s a book about pranksters. A kid comes to a new school and wants to be the school prankster, but this school already has a prankster. He must outdo and uncover the other. A book about friendship. Ended the Origami Yoda series last year because the story was ending. What they are about: A poop fountain, and a rat with a human face — sort of cast as historical fiction. About real kids. Need to find the audience. New book in the fall: Picture book about a toad McToad Mo’s Tiny Island. It has every form of toddler-beloved transportation. A little simpler than his previous books. Character ended up being a sock monkey (like one he’d stolen as a child). Favorite toy is stolen — can he get a new friend or not? Be his own best friend? The Thing About Spring – a character who hates spring and doesn’t want anything to change. Trying to save snow for later. Andrea Beaty – Rosie Revere Engineer will be going to the International Space Station this fall — Storytime from Space! andreabeaty.com has info about the illustration process. Fluffy Bunnies 2: The Schnoz of Doom sequel to Attack of the Fluffy Bunnies. Originally, it was supposed to be about bunnies so cute they make the cats on the internet weep from jealousy. Became six-foot-tall scary bunnies from outer space and their planet is going to be struck by a marshmallow. Kids save the earth from the enormous fluffy bunnies — until now. It’s a hybrid graphic novel with Dan Santat. Some real science, but utterly stupid. Ethan Long: Hi! An original board book series. Profile eyes to make it subdued and unthreatening. 18 words. 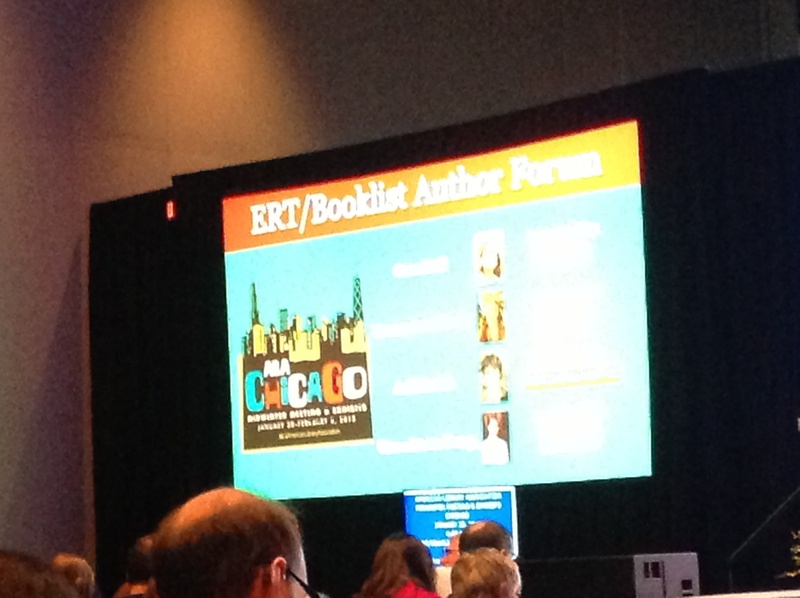 I’m at ALA Midwinter Meeting in Chicago. Last night, thanks to a tip from Sarah Flowers, whom I saw in the hotel eating area, I went to a meeting at my hotel of the United States Board on Books for Young People. This is the 10th year that USBBY has made an Outstanding International Books List. They are books published in the United States, that originated in a different country, and they help American children see other perspectives. This year’s members presented the 2015 titles — They definitely made me want to read them. Sabaa Tahir, author of An Ember in the Ashes. She has family all over the world. Her personal history: Begins in the Mojave Desert, grew up at Richcrest in a Motel which her parents managed. She knew from an early age that she didn’t belong. People told her parents to go back to where they came from. She was voiceless. Her Kindergarten teacher didn’t think she could talk. She escaped to the library. Particularly fantasy novels. She was a hero and an adventurer when reading. These characters would have the chance to speak out. She was working at the Washington Post — reading about the most powerless and voiceless people in the world. Also about courage, loneliness, love, family. Intersection of hope & despair. The decisions they make define everything that comes after. She made the book as authentic as she could — lots of research. She interviewed modern day warriors to get the souls of her characters. Talked with an FBI agent who fought gangs in San Jose. Psychological matters a lot more than the physical. Was told there are people in the police force who should not be in positions of authority. West Point cadet had a presence.”Duty Honor Country” – not just words, a way of life for him. Researched Ancient Rome – Julio Claudian era. Social stratification based on that. Used Sparta for the academy. Spartans entered at 7 years old. Her female character must become a slave. Researched what it was like for slaves in everyday life. Also storytelling research. Saw a Persian storyteller, practicing the ancient art of Nakali — which women aren’t normally allowed to practice. Amazing storyteller — even in Farsi. She used her whole body, and without the language she could still understand the story. Character names: Each race has its own naming conventions. Each character had a name that fit with them. Elias — a humble Hebrew statement of faith. The names Elias and Alia are supposed to sound like a song when together. Writing for her is research, and revision, and frustration. It took her 6 years. She wanted to tell their story. In the end, she wrote because of her desire for a voice. She wants to speak to those who feel they do not have a voice. Yay! I’m at ALA Midwinter Meeting in Chicago. Tonight I’ve got a cozy night in my hotel room, so my plan is to write up my notes from the sessions I’ve attended so far. First up was an Author Forum featuring authors of Graphic Novels — Cece Bell, Jeff Smith, Francoise Mouly, and Gene Luen Yang. Moderator: How did you start with comics? CB: When she was 7 or 8. Older brother had National Lampoon. Friend had Beano, from England. Jeff Smith: Peanuts, Pogo, National Lampoon, MAD Magazine — father read it to him. Francoise – Grew up in France, where comics were ubiquitous. Magazine Pilot, inspired by MAD. Gene: Started collecting comics in the 5th grade. Marvel 2 in 1 – Mom made him get Superman instead. The bomb dropped in the comic and captured his imagination. Mostly superhero comics were available then. Did find Bone — proved to him that comics don’t only have to be about superheroes. What does it mean when someone labels your work “All Ages”? Francoise: “Little Lit” was labeled for All Ages. She realized later that’s not helpful. Labeling provides guidance, because you can’t tell at a glance what level is appropriate. Gene, How do you feel when Middle Schoolers are assigned to read your stuff? Gene: It’s NUTTY! He started American Born Chinese as pamphlets he copied himself. His own son’s class just did it. Since he deals with racial stereotypes, he does worry that the kids get it. When he sees middle school teachers leading thoughtful discussions about the issues the book raises, that’s the best case. We shouldn’t talk them out of comic books by assigning it in school! Cece, feedback about El Deafo? Cece: Kids like her are so happy about it. A format they can share with their friends. Also adults, to explain what they go through. It has become a manual, as well as a story of friendship. A manual so people know how to talk to her! Response from kids and adults without hearing loss has also been wonderful. Nicest thing: “I am now meeting people who are like me, wearing hearing aids and lip reading.” When she meets people like that, her world implodes. Francoise: The abstraction of comics helps pull everyone into the character. Comics are a young medium, and is opening up. How do you think comics fit into the movement toward diversity in children’s literature? Gene: In comics, you can’t hide your character’s diversity. How do we present cultures that are not necessarily mainstream? That we are not necessarily a part of in an authentic way? Need to find a balance — not running roughshod over other cultures, but not being afraid to include them. Francoise: Cartoonists have been killed for their art. Being brave enough to go there! As visual people, they go with the essence of things. A cartoonist has not only the ability, but the duty to bring this to the table. It’s not like they give the answer. But cartoonists tend to gravitate toward wanting to understand things. If a cartoonist doesn’t communicate, it’s on them. This is a good medium for exploring diversity. Comics are very intimate — you see the hand of the author. The sharing of experience, like Cece mentioned — very vivid and intimate. Jeff – Hand drawn is extra intimate. The mixture of the word and picture is dangerous and soupy. About Charlie Hebdo — the power of the cartoon image is tremendous — but this is a whole new level of messed-up-ness. Francoise – The issue feels very close to my heart. Jeff – Francoise has been choosing the New Yorker covers for 21 years. Controversy! The image completely shook up the whisper campaign that Obama is a Muslim. Francoise: You can show in a cartoon in a way that really brings it to the front. That cover got 20,000 insulting letters. Cogent remark from Candidate Obama: “After all, what is exactly wrong with representing a Muslim in the White House?” Why is that such a shocking image? The cartoonist can shine a flashlight on issues: Let’s talk about it! Better than hiding things under the rug. Jeff: Well, I’d make more money. Certain pieces of information are more effectively communicated visually. Gene: Comics in Legos, comics in airplanes. Sequential visuals. There’s a visceral power to the simplified image. To put an emotion directly in his reader’s gut, he goes with an image. Cece: A gateway for kids who have trouble reading to start. Deaf kids are already more visual than verbal, and it gives them a headstart. Visual Literacy: Do you think championing comics as a way to learn visual literacy pigeonholes them? Jeff — Visual literacy has *always* been a real form of communication. More images does not mean it’s dumbed down. Visual literacy is incredibly primal to us. Even though he’s talking, he’s still using his hands. Life is visual! It’s a form of writing that can be as communicative as any other form. Francoise: Only in the last 25 years have cartoonists thought of themselves as authors — and only the last 10 years that others have. Some think pictures replace your imagination. More like poetry and graphic design – both very distilled forms. Makes for much more sophisticated readers. Jeff: Unlike a film — director has made timing decisions, more passive. Comics, like a book, require you to engage and use your imagination. You have to make them come alive. Jeff taught himself how to read with Peanuts. A real thought in those days was that comics caused illiteracy. Even as a kid, he knew that was ridiculous. He knew he was reading. For him, it was absolutely crucial to his imagination and storytelling. He used his brain to turn it on and discover these real people in comics. Cece — You have to fill in what happens in between panels. Gene — I don’t think of it as a pigeonhole, but as a foothold. Francoise — We need a vocabulary to talk about visual media. Moderator: Making comics is difficult. Why are you doing it? Cece: “I am a terrible descriptive writer.” Being able to tell the story in pictures is a way to get around that. Being able to use the speech balloons to show what hearing loss is like is so much more immediate than trying to use words to describe it. Allows the reader to experience it right then and there. Gene loves comics with a pre-logical love. His storytelling voice is in comics. Francoise – She was groomed to be a surgeon. Realized as a teenager she wasn’t going to do that. It helped that her family wasn’t interested in comics. She studied architecture. Was frustrated that your plans are rarely realized. She met Art Spiegelman in NYC. He courted her by reading her comics. She couldn’t believe there was this world of potential hidden in plain sight. She fell in love with him the same time she fell in love with his medium. Moderator: If you could recommend two books every library should carry, what would they be? Gene: Usagi Jimbo (a samurai rabbit) By Stan Sakai. He does his research, so his has lasted. Meanwhile, by Jason Shiga. Choose your own adventure — Maze and comic combined. Cece: Ed Emberley (to create comics) Anybody can draw with these books! After this wonderful panel, I was able to get books signed by the authors featured, and then hit the Exhibits! I managed to restrain myself to 37 books that first night. No, that’s not very good self-restraint. Overdue Media, Seattle, 2005. 120 pages. We recently had a Library Staff Day, and Bill Barnes and Gene Ambaum spoke, and we each received a copy of one of their books. I have seen Unshelved online, but I had forgotten just how funny their cartoons are. Unshelved is set in Mallville Public Library. 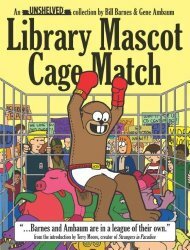 The comic is written so that even non-librarians will find it funny. However, we librarians? We think it’s hilarious. At last the world is having some of their misperceptions about libraries cleared up! 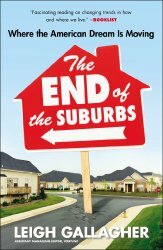 This book also includes, in the center, a full-color graphic novelette, “Empire County Strikes Back,” when a high-tech bookmobile from a neighboring county tries to take over their customers and close their library. There’s a lovely scene at the end where Dewey explains all that librarians do for their community, which technology can never replace. It’s time to take sides. Are you going to be seduced by the lure of high technology or are you going to support your local public library the way we support you? I need to take another look at this webcomic. Time to sign up for those daily emails – and order more of the books. Hay House, Carlsbad, California, 2014. 182 pages. 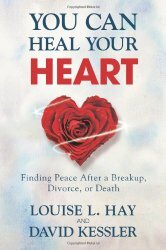 I picked up this book because I like Louise Hay’s work, and of course can always use more healing after my divorce. I also recently broke up with a boyfriend for the first time in my life. We’d only been dating two months, but still, this was new to me. David Kessler I hadn’t heard of before, but he is an expert on grief and loss, so he brings solid credentials to the book. I think of Louise Hay as New Age-y. She focuses mainly on the power of affirmations, which I have some skepticism about. However, they take a solid look at your self-talk after loss and help you reframe your thinking and choose to see the positive. And Christians will find nothing to fault here. They may want to substitute “God” where Louise Hay uses “the Universe,” but everything else I think they can agree with. A broken heart is also an open heart. Whatever the circumstances, when you love someone and your time together ends, you will naturally feel pain. The pain of losing a person you love is part of life, part of this journey, but suffering doesn’t have to be. Although it’s natural to forget your power after you lose a loved one, the truth is that after a breakup, divorce, or death, there remains an ability within you to create a new reality. Let’s be clear here: We’re asking you to change your thinking after a loss occurs – not to avoid the pain of grief, but to keep moving through it. We want your thoughts to live in a place where you remember your loved one only with love, not with sadness or regret. Even after the worst breakup, the meanest divorce, and the most tragic death, it is possible to achieve this over time. That doesn’t mean that you deny or run away from the pain. Instead, you let yourself experience it and then allow a new life to unfold – one where you hold the love dear, not the sorrow. The three main areas they focus on are helping you feel your feelings, allowing old wounds to come up for healing, and changing distorted thinking about relationships, love, and life. Grief is a time of mourning all that has been lost – the dreams that have been shattered, and the loss of hope for the marriage you thought you were going to always have. However, when you can arrive at sweet acceptance that what has happened did actually happen, you will find that grief is also a time of renewal, rebuilding and reforming. You now have the opportunity to create yourself anew. Who will you be after the divorce? Don’t just leave a void for others and your past to fill and define you. Choose who you want to be. This is a new chapter, and you have the opportunity to start again. If you’re thinking, It’s too late for me to start again, just know that that is only a thought – and one that isn’t true. If you’re still residing on the planet, it’s never too late for you to start over. The reality is that grief from pet loss is not as easily fixed as some would have us believe. It’s hard to live in grief that’s judged as unworthy. Grief is about love, and our animal companions often show us some of the most unconditional love we could ever experience. How often, despite our best efforts, do we absorb some of society’s judgments and think, I shouldn’t be grieving this much? Yet when we let these thoughts in, we betray our genuine feelings. This is a gentle, hopeful and encouraging book which reminds you that a broken heart is also an open heart. You are currently browsing the Sonderbooks blog archives for January, 2015.